To get it full size (2000x1242), click the image to go to my photobucket then keep clicking the zoom button. It should prove helpful for restorations, either printed as a sticker or as a stencil. 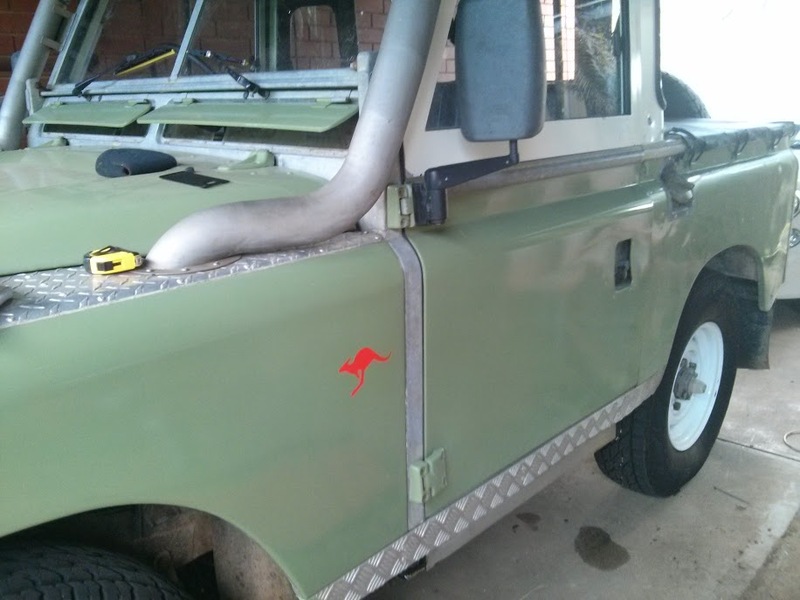 Sorry for the thread resurrection but this thread started my kangaroo quest Wrote a short guide on sticking one on my landrover, along with correct placement (based on images of 2 different landrovers with this logo), which i was unable to find anywhere. Hopefully it will help someone out there. I actually went looking through Google images to try and find the image sources but as with all good google searches i couldn't get the same results as i got the first time . What credit would you want on the images? just whats in your sig? or url? Hope you put yours in the right spot Juddy don't think it was on when you bought it!? Actually there is no "correct" position it is more informal and relatively infrequent. unless associated with a Christmas tree then on land rovers it is behind front wheel arch. In Vietnam kangaroos went on the doors. Actually some put a U.S. star on so the septics could work out they weren't VC! If there on the WWW no issues at all, its a free domain, and very hard to police. To be honest I have no idea if there correct, I went off the ones on the workshop, and cross referenced further with one in the flesh, so hopefully about right. But I have seen them in different positions so I don't think theres an exact way, saying that its good to have a base template people can work to. Ahh the Red Rat as a few refer to them. On photos, while they may appear online freely, there is still copyright implications that people have a rendancy to overlook these days unfortunately. Ahh the Red Rat as a few refer to this Venapro for them. Thanks Dervish. I was wondering about the red kangaroo logos. I thought they might have something to do with Australia. From appendix 3, page 293, of 'Mud & Dust': 'A National symbol, to ensure that vehicles were instantly recognised as Australian, was adopted soon after arrival in South Vietnam. This was a leaping kangaroo, facing to the viewers left. It was stenciled onto vehicles in either red white or black. The shape of the kangaroo was supposed to be the same as that shown on the Australian penny, but variations have been noted, including a kangaroo standing at rest. Placement of the kangaroo appears to be arbitrary, with the sign appearing on doors and bodywork, sometimes in several places and facing either left or right. Later, the AHQ specification for the placement stated that the symbol was to appear on the front, back and both sides of all vehicles and plant'. Is there any truth to the statement the kangaroo must always face forward? Well I guess it should (as on the RAAF roundel). I find it fascinating that in the mid 1960's only a couple of years before the red rat became a standard marking on Aussie vehicles in Vietnam, there was a command instruction to remove additional markings including kangaroos from Aussie Army vehicles in Borneo/Malaya. To be correct the roo's for a Vietnam era vehicles shouldn't have a toe as noted by mike k it is the penny roo and if you check out a penny the roo has no toe. The roo with a toe as shown at the beginning of the thread is what is specified now. There is no exact position specified for markings it's where the person who applies it puts it but there is a rough location where things need to be.But really who cares.